"Capitalism needs to lift its game." Karl Du Fresne has a very readable column posted entitled, Capitalism needs to lift its game. Essentially we blame systems instead of the individuals tainting them. Capitalism gets a bad name because of greedy, immoral people. The law gets a bad name because of exploitive, dissolute lawyers. Democracy gets a bad name because of unprincipled, power-hungry politicians. It doesn't follow that we throw out the systems. "...is the only economic system that has consistently demonstrated, over time, that it can improve the human condition. That’s why all the most humane, liberal, advanced societies in the world have capitalist economies." Frankly, I would settle for a large reduction in the size of the welfare state but its inbuilt mechanisms mean it will always tend towards growth. There-in lies the conundrum. Last night was the grand final of Homai Te Pakipaki. I voted for Dane Moeke - not because his was the best performance on the night. But because he has the most talent. Unfortunately last night it was looking raw, almost undercooked. At every performance Dane has tackled songs that have stretched his voice. His first performance of I Will Always Love You was amazing - a much overused word that I rarely use. And two weeks ago he took on the Celine Dion number, My Heart Will Go On. Apart from one crack, again he delivered the crescendos powerfully and left me transfixed. But last night he bit off more than he could chew. I don't know whether the song was his choice but he could have done with better advice. The winner, Roland Williams, sang Me and Mrs Jones superbly but it's a safe choice for any half decent male singer. And he does have the x factor going on with the ladies. He was the only danger to Dane. But Dane. You were the winner of the series on sheer potential and for having the guts to push it. Today go watch Little Miss Sunshine because it'll lift your spirits and it has a message that you need to take to heart. Winners are the ones who never give up. If I don't hear you sing again I will be much the poorer for it. 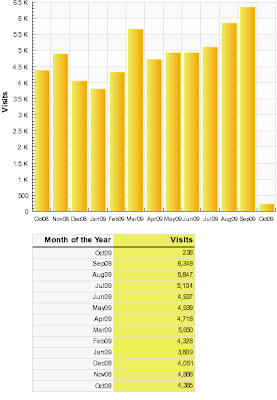 Exceeded 6,000 visits for first time ever last month. Thanks for staying tuned in. And leaving comments which I (nearly) always appreciate. And for being civil and considered. There are social trends happening here - and in other similar developed countries - which demand some attention. It is true that through the second half of the nineties and early part of the 2000s some social indicators were heading in the right direction. But inexplicably they reversed. No. It wasn't the advent of tougher economic times because the trends reversed in advance. Examples; Teenage birth, drinking and driving, crime in general, homelessness (anecdotally), youth suicide? A couple of these are exclusively functions of the young, others, disproportionately. But there hasn't been a demographic blip. I have another theory. The change is driven by the children born in the last recession who have been hitting adolescence and young adulthood. In 1990-1992 welfare dependence was very heavy. There were far more young people on welfare than ever before. They were abusing alcohol and other substances in greater numbers than before. Many, subsequently, never left the welfare ranks. Thus their children were affected pre- and post birth by their lifestyles. Many are disaffected and lawless. And probably mentally disturbed. Oh yes. Prohibition is a wonderful deterrent. Recorded cannabis offences rose by almost 26 percent in the year to June 2009. The June quarter crime statistics have just been released and they aren't good. What irks me no end is the spin the police put on them. There were 442,540 recorded offences compared with 426,690 for last year, an increase of 3.7 percent. During this time New Zealand's resident population increased by approximately one percent. So, the recorded offence rate per head of population increased by only 2.8 percent. That's 15,850 more offences. Many, many more victims of crime. It is the job of the police to prevent crime, not to normalise or downplay it. My generation commonly referred to adults as 'grown-ups'. I suppose it was the natural extension of the often-asked question, what are you going to be when you grow up? Or, what are you going to do when you grow up? I am going to have kids, then I am going back to school to learn how to be a grown-up. But Anne Tolley says nobody can force you to. Not even Work and Income. That's good. 'Cause I was about as interested in a second time round as I am in the first. Well if you aren't interested in learning how to be a grown-up from strangers, what about your own mum and dad? Well what about your mum? Minister for Social Development, Paula Bennett, is in Paris addressing her OECD counterparts about what New Zealand has done in the face of recession. “I’ll be focusing on our country’s strong “work first” approach. Unlike other countries, we don’t hand over a benefit and then offer to help someone find work." Now she may be saying that in a media statement, but what's the chances she will say that directly to other Ministers? Then again, this is Paula Bennett. Just which countries does she think let people onto welfare more readily than NZ does? It'd be interesting to know. NZ has not been hit as hard as others by the recession and fortunately, when redundancies have occurred, other jobs can sometimes be found, hence NZ's success in work placement. But let's not go near other benefits..... For instance, if NZ treated workless single parents as unemployed, in the way other OECD countries do, her 'triaging' record would look a lot less positive. “I’ll also look at how we’ve stimulated the economy through tax cuts ...."
Well, I must have missed that. So I can't comment. Anybody else want to? In 2008 the Maori Party campaigned on ending child poverty by 2020. Child poverty is, however, implicitly tied in with welfare dependence. Periodically Pita Sharples is heard promoting work-for-the-dole. He has said that welfare is hurting Maori, destroying their mana. And yet, in the same breath, he acknowledges that sole parents are part of Maori culture and must be supported. Violence - "a harsh lesson in reality"
The young cynic takes a candid look at violence. More than two dozen drug experts, academics, border journalists and law enforcement officials gathered to compare notes for three days about drug policy, coming from Mexico, the United States and even Colombia. Two seemingly unlikely advocates of radical change at the conference were Terry Nelson, a retired federal agent, and James Gray, a California state judge, both of whom once sent drug offenders to prison. “The global war on drugs is probably the greatest public policy failure of all time,” said Nelson, who stalked traffickers in the Caribbean and Latin America during three decades with the U.S. Border Patrol, Customs and Department of Homeland Security. Nelson said the answer is legalization, education and regulation, the treatment given two other dangerous but popular legal drugs, alcohol and tobacco. PAUL What do you want to actually see Hone, do you want to see a ban, do you want to see prohibition? "...You can't create a black market in a situation where people don’t really want the product." If people "really don't want the product" why is there a substantial existing legal market? PAUL So you'd ban cigarette sales, ban tobacco, production of tobacco, marketing tobacco, well that’s already banned, you'd ban the sales but people will still want their smokes, that’s what I'm saying, because you would now turn them into criminals. HONE No no no no no. HONE No no no no no no no, we have deliberately not targeted smokers because I know from having been a smoker that if you target smokers all you do is piss them off, so you go after the tobacco companies and most smokers actually support what it is that we're trying to do here, that’s number one, number two you have to arrange a regime whereby you can help people wean themselves off tobacco, but again going back to that fact again, that most New Zealanders who do smoke want to stop, it's not that hard to do. Apparently it's not that hard to give up heroin either. Yet despite it being illegal there are still thousands of heroin addicts. PAUL You see even Helen Clark thought that prohibition had its limits and might not work, she said the trouble with prohibition and banning and she is very stridently anti tobacco, she said it makes criminals of addicts. So the courts clog up because someone's been caught smoking a cigarette. HONE No no no, no no no, the courts don’t clog up with smokers, because we're not banning smoking, we're banning the production, sale and manufacture of tobacco. The only people who would end up in court would be the tobacco companies, but if we pass the law they'd be gone tomorrow Paul, wouldn’t you be happy? PAUL Probably so I suppose, but where would we get our smokes? From the gangs? HONE No you wouldn’t get your smokes from the gangs. PAUL Of course you would you'd drive it underground. HONE No you wouldn’t get your smokes from the gangs, because the gangs find greater money in other drugs, cigarettes are not that kind of a product. You would maintain a measure of production for weaning off purposes, for all of those kinds of situations but again going back to the knowledge and the fact that most New Zealanders want to stop it's just enough to get them out of the game. Paul, 5,000 New Zealanders every single year die form cigarettes. If a country did that to us Paul, we'd declare war, a company's doing it to us and we're letting it happen. There's something wrong there. PAUL At the same time though Hone a nicotine addict doesn’t rush out and bang an old lady on the head because he hasn’t got any smokes left. Why don’t you tackle crime? HONE That’s great if a smoker's not going to go to knock and old lady on the head over cigarettes, well let's just ban it, it's not gonna lead to any crime. HONE If you want to get into this whole sort of gang thing Paul, in the history of the gangs say since 1970 there'd be less than 500 people have died as a result of that, in that same 30 year period, in that same 30 year period, listen to this Paul nearly 100,000 New Zealanders have died from tobacco. What's the big fuss about gangs, it's not gangs that’s killing New Zealanders it's tobacco. Un-bloody-believable. There is no account taken of the difference between the kinds of violent, often young, deaths associated with gangs and prohibition and people dying from smoking related illnesses towards the end of their natural allotted time. Or that drugs that gangs manufacture and sell also kill. ...Look the thing that gets me is this, he gave up smoking, it's a matter of personal responsibility and he's trying to claim that other people can't, it would be far better if he actually said to people this is something you have to take personal responsibility for, it's not easy but I've done it, if I've done it you can do it, instead he wants the colonial state to ban cigarettes for him. I mean it's the most patronising statement I've seen from a politician in a long time, and there's plenty of competition for that position, but what he's doing won't work, and just because it's a good cause that doesn’t make it right.....In the valley that I'm in there's so much marijuana grown and smoked that you actually see people smoking it quite openly. Now the Police can't stop that, and yet here we are having an MP who apparently is so out of touch with his electorate doesn’t realise that marijuana is growing wild in the north and is now saying he's going to ban tobacco. Look if I was in organised crime and I heard Hone this morning, I'd be writing out a cheque for his campaign. Every day there are stories in the media related to alcohol laws and consumption, with an emphasis on young people. One could get bored by them. Or one could have a look at some statistics. When I overlay the 15+ population it looks like this. It is interesting to see how this translates to the amount of alcohol available for consumption per person above the purchasing age (noting that the minimum age for purchasing alcoholic beverages changed from 20 to 18 years in 1999). 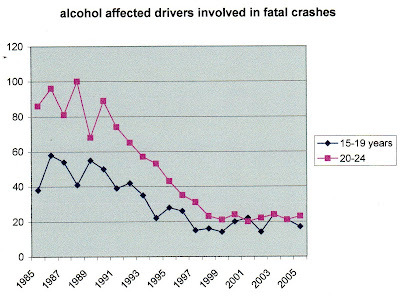 Before this, the amount of alcohol available per person aged 20 years or over had generally been declining since 1986. It fell by 24 percent, from 12.8 litres per person in 1986 to 9.8 litres per person in 1999. Since the purchasing age was lowered, the amount available per person aged 18 years or over has risen slightly from 9.4 litres in 1999 to 9.8 litres in 2007. So what we are currently experiencing daily through the media is largely unsubstantiated moral panic. Yes there are problems with alcohol. Nobody in their right mind would deny it. But is the situation any worse than it was 20 or 30 years ago? And I put that time frame on it because it is those who were young 20 or 30 years ago making the fuss and clamouring for greater regulation. Of course it is all cloaked in well-meaning paternalism like "...too many young people are killing themselves on the roads." Well, of course they are. One is one too many. But, again, is it getting worse? No. Young Robert has leapt back to life. Can't tidy or censor the stuff. It just is. There are those who want to see local government much more heavily involved in "improving social well-being" - in practical terms providing more social services, social housing, etc. Maori will push this agenda because they want funding channelled into outfits like urban Maori authorities so that they can provide (and control) what they want for their own people. Well, that might be OK if central government was getting out of the game - but it ain't. This will be a whole new layer of government activity paid for by you. Brown and Bradford for Super city?